Richard MacGillivray Dawkins (18711955) was an archaeologist and a scholar of classical and modern Greek. After studying and for a time working in electrical engineering, a windfall enabled him at the age of twenty-six to enter Emmanuel College, Cambridge, to read classics. After graduating he became associated with the British School at Athens, eventually becoming its director. He studied Greek dialects and was involved in excavations in Crete, at Sparta and elsewhere. From 1916 to 1919 he served as an intelligence officer in the Royal Naval Volunteer Reserve, in eastern Crete. 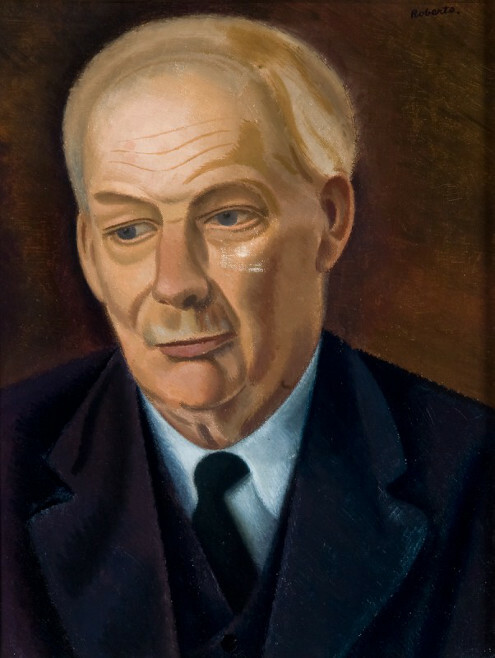 In 1920 he was appointed to a chair of Byzantine and modern Greek in the University of Oxford, and in 1922 he became a fellow of Exeter College (from which he retired in 1939, continuing to hold rooms there until his death) and an honorary fellow of his old college, Emmanuel. According to Osbert Lancaster, 'No eccentric professor of fiction could possibly hold a candle to the reality of Professor Dawkins whose behaviour and appearance placed him . . . in a class by himself. Ginger-moustached, myopic, stooping, clad in one of a succession of suits which he ordered by postcard from the general store of a village in Northern Ireland, he always betrayed his whereabouts by a cackling laugh of great carrying power' (With an Eye to the Future (London: John Murray, 1967), p. 77). He had known Ronald Firbank and Baron Corvo, and was an early collector of watercolours by Edward Lear.